Has Your Baby's Car Seat Been Recalled? Baby car seat manufacturers must occasionally issue recalls in order to better protect your baby when they realize that something about the car seat is faulty. Fortunately, car seat recalls are not very common. After purchasing a car seat, you should register it with the manufacturer in order to receive the fastest notification of any applicable recalls. If you have not yet registered your car seat, you can do that easily by calling the manufacturer (there's a phone number right on one of the car seat labels) or visiting their website. 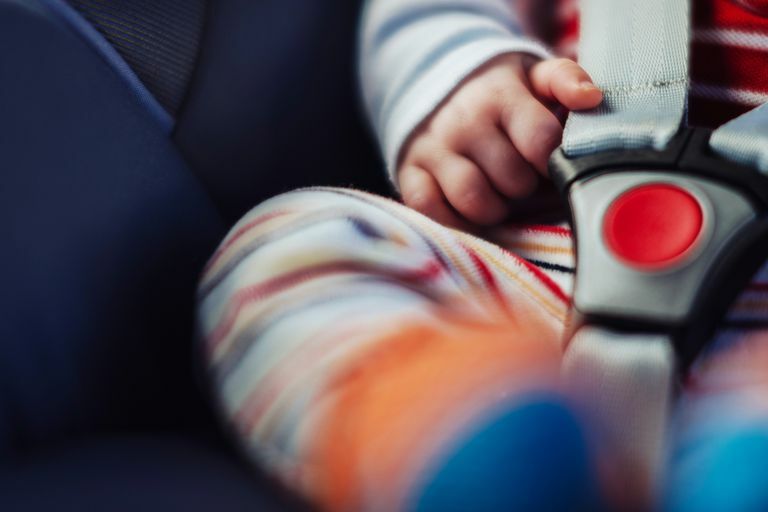 It's also a good idea to check the National Highway Traffic Safety Administration's (NHTSA) extensive recall list if you borrow a car seat from a friend or need to use an older car seat again after a period of non-use. Below is a list of the most recent car seat recalls and information on corrective actions being taken. April 17, 2018: Certain Harmony Big Boost Deluxe booster seats were recalled due to the seat belt causing excessive force to be applied to the child's chest in the event of a crash, causing the car seats to fail to comply to the requirements of Federal Motor Vehicle Safety Standard number 213. Affected car seats were manufactured between November 1, 2015, and June 24, 2017. A remedy solution is still being determined and registered owners were mailed notices about the safety risks on August 21, 2018. A second notification will be sent once a remedy is determined. Owners may contact Harmony at 877-306-1001. November 22, 2017: Certain Diono Radian R100, Radian R120, Radian RXT, Olympia, Pacifica, and Rainier convertible and booster car seats were recalled due to them failing to conform to the requirements of Federal Motor Vehicle Safety Standard number 213 when attached to the car with the lap belt but without the top tether. Affected car seats were manufactured between November 25, 2013, and September 5, 2017. Diono will notify registered owners and provide a free remedy kit, updated instruction manual, energy-absorbing pad, and new chest clip. If you have not registered, you may contact Diono at 855-215-4951. July 7, 2017: More than 25,000 Graco My Ride 65 convertible car seats are recalled because the harness webbing may not adequately restrain a child in a crash. Affected models are: 1871689, 1908152, 1813074, 1872691, 1853478, 1877535, 1813015, and 1794334. Graco will provide registered owners with a replacement harness. If you didn't register your car seat or you aren't sure if your car seat model is included, contact Graco at 800-345-4109. June 21, 2017: Britax recalled certain rear-facing car seats from its B-Safe 35 line due to the center tab on the chest clip marked "ABS" potentially breaking. Affected car seats were manufactured between November 1, 2015 and May 31, 2017. Registered owners of an affected model will be contacted by Britax and issued a replacement chest clip marked "PC" free of charge. If you have not registered, you may request a replacement clip by contacting Britax at 833-474-7016 or visiting www.bsafe35clip.com. Affected model numbers: E1A183F, E1A185M, E1A185P, E1A186R, E1A203F, E1A205M, E1A205P, E1A206X, E1A206Z, E1A207E, E9LU65V, E9LU66X, E9LU66Z, E9LU67D, E9LU67E, EXA185M, S02063600, S02063700, S03803400, S03803500, S03803700, S03803800, S03803900, S04144400, S04144500, S04144600, S04145000, S04402800, S04884200, S04884300, S04975600, S04978900, S05260200, S06020300, S06020400, S06020500, S06020600, S06020700, S06020800, S06020900, S06147100, S921800, E1A215T, E1A215U, E1A216P, E1A221Q, E1A225C, E1A225U, E1A226L, E9LS51Q, E9LS56C, E9LS56L, E9LS57F, E9LS57G, E9LS57H, EXA216L, S01298600, S02063800, S02063900, S02064000, S04281200, S04281300, S04628500, S06018800, S06020000, S06020200, S923700, E9LT34A, E9LT34C, E9LT35X, and EXLT34A. January 10, 2017: About 1,600 4Moms infant car seats are recalled because a coupling hook may not properly engage around a coupling pin, preventing the car seat from securely attaching to the base. 4Moms will replace the car seat portion for registered owners. If you did not register your car seat, contact 4Moms at 888-614-6667. Dec. 29, 2016: A small number of Baby Trend Centennial 3-in-1 boosters are recalled because the center adjuster rivet can pull through or break if it is used with a child weighing more than 40 pounds. Baby Trend will notify registered owners and provide a replacement or refund. If you were not notified by the company, call Baby Trend at 800-328-7363. April 29, 2016: Nearly 1,500 Kiddy World Plus combination car seats are recalled because the buckle may only partially engage, and may not adequately protect a child in a crash. Registered owners will be notified and will receive a full refund for the car seat. If you did not receive notice of the recall, contact Kiddy USA at 855-92KIDDY. March 3, 2016: Transitions car seats manufactured before January 29, 2016, are recalled because a child can reach the center front harness adjuster and loosen the harness. This could allow a child to be improperly restrained, which could lead to injury in a crash. Evenflo will provide a remedy kit to prevent a child from reaching the harness adjuster. Click the headline link to enter model numbers and receive the repair kit. February 15, 2016: Some Graco car seats are recalled because the labels do not tell consumers where to find the printed instruction manual and to follow both the instructions and the labels. Affected models are: ComfortSport 1794333 & 1813040 manufactured between March 2014, and February 2015; Classic Ride 1812930 manufactured between March 2014, and February 2015; and Ready Ride 1924519 & 1924520 manufactured between March 2014, and February 2015. Click the headline link to enter the model number and receive replacement labels. August 2015: Some Britax Advocate, Boulevard, and Marathon convertible car seats with the ClickTight feature are recalled because the ClickTight button may remain down in the release position after the harness is tightened. Affected car seats were manufactured between August 1, 2014, and July 29, 2015. In the US, the following model numbers are included: E9LT95Q, E9LT95Z, E9LT95N, E1A025Q, E9LT86F, E1A135Q, E9LT86G, E9LT85Q, E9LT86A, E9LT86H, E9LT85S, E1A015Q, E1A016A, E1A016H, E1A166F, E9LT87J, E1A116L, E9LT76P, E9LT71Q, E9LT76N, E9LT76B, E9LT75R, E9LT76L, E1A006B, E1A005R. In Canada, the following model numbers are included: E9LV31Q, E9LV35R, E9LV36B, E9LV36L, E9LV36N, E9LV45Q, E9LV45S, E9LV46A, E9LV46H, E9LV55N, E9LV55Q, E9LV55Z. If you registered your car seat, Britax will send you a repair kit. If you did not register, visit the ​manufacturer's website to verify your car seat is included and to order a repair kit. August 20, 2014: More than 39,000 Recaro ProSport combination harness and booster seats are recalled because they don't meet the federal requirement for head excursion when installed using the lower anchors and no tether. Excessive head movement in a crash increases the risk of injury. ProSport model 385 car seats made between June 16, 2010, and January 31, 2013, are affected. If you registered your car seat Recaro will send you a new set of instructions and new labels that indicate you should stop using LATCH once your child reaches 40 pounds. If you did not register your car seat, or you have questions about the recall, contact Recaro at 888-973-2276. It is still safe to install this car seat using a seat belt and to properly install it using lower anchors and a tether for children under 40 pounds. Graco will provide registered owners with a replacement buckle. If you did not register your car seat, you should visit GracoBuckleRecall.com to order a new buckle. While you wait for the replacement part, you can clean the existing buckle using manufacturer's instructions. Visit the Evenflo website to order a replacement buckle. You can also use the manufacturer instructions for cleaning the existing buckle if it is difficult to unlatch. April 1, 2014: More than 16,000 Baby Trend Trendz Fastback 3-in-1 car seats are being recalled because the buckle could become stuck in the latched position so that it can't be unlatched by pushing the release button. Affected models are FB60070 (Granite) and FB60408 (Jellybean) that were manufactured between 10/2011 and 7/2013. Baby Trend will notify registered customers and send a replacement buckle. If you did not register your car seat, call the manufacturer at 800-328-7363 to order a new buckle. Registered owners will receive instructions to order a free replacement harness buckle. Others should visit the Graco recall page to order the replacement buckle. Jan. 31, 2014: About 33,139 Combi car seats are recalled because the harness webbing fails to meet minimum breaking strength requirements. The following car seat models are recalled: Coccoro car seats manufactured between January 6, 2009, and December 5, 2012; Zeus 360 car seats manufactured between February 25, 2009, and May 24, 2012; Zeus Turn car seats manufactured between July 15, 2007, and March 25, 2009. Register your car seat with Combi to receive replacement harness webbing. The car seat may be used before the repair kit is installed.